It’s that time of the year again for the newest members of IIT Kharagpur! 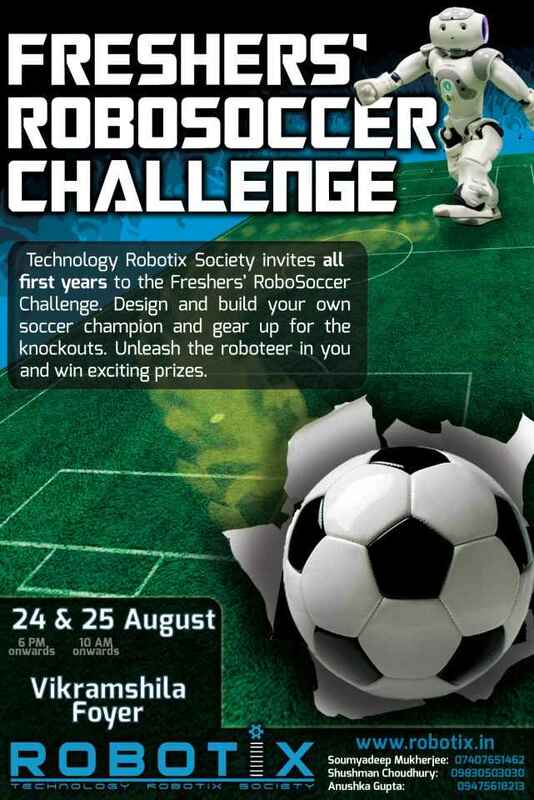 Technology Robotix Society brings to them its first event of the academic calendar, the** Freshers’ Robosoccer Challenge**, from the 24th to the 26th of August. Teams are required to build and operate a manual robot to play one-on-one football in a knockout tournament. Robosoccer combines the universal excitement and amusement inspired by football, with the thrill and satisfaction of making a working robot from scratch, so as to provide a unique and memorable experience for all the participants. Traditionally, this event has always been a crowd-puller, and a tremendous amount of fun on part of Team Robotix to organise and pull off. There is always something or the other going on while it happens. Teams gather at the venue in droves, buzzing around their robots, the making of which was a first-time experience for most of them. Meanwhile, at the arena, two teams square off, with their bots tussling over the ball and trying to both score and defend. There is cheering, heckling, congratulations and arguments, massacres and nail-biters, and so much more. Pervading all of this is a sincere enthusiasm for robotics and a healthy spirit of competition. The problem statement in and of itself is not so complicated. It essentially amounts to building a simple differential drive, along with a kicking mechanism that depends on the creativity of the team. Moreover, all the requisite knowledge and assistance for making such a robot, is being continuously provided for the freshers, by Team Robotix, through the KRAIG classes and the hands-on sessions. Ultimately, it depends on the interest of the students to take the initiative and make something they can be proud of. So, to come full circle, it is the need for that initiative among the first years that makes Robosoccer so special. It represents the very first steps for so many into a field that some may grow to love, not just as a hobby but as a profession. 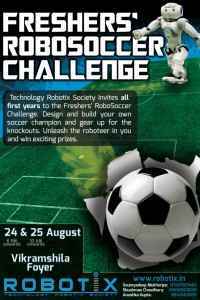 Many of the most accomplished robot designers in campus got their first taste of this tantalising field through the trials and tribulations that went in to making a robot for Robosoccer. We hope that this will always be the case every year. The aim of Technology Robotix Society, as we have reiterated, has always been to spread the culture of robotics across as many people as possible. This event allows us to reach out to as many fresh faces as possible, in the hope that they might find something which attracts them. And we get to have so much fun while doing it. It is a win-win situation indeed.